When I stopped by the Snagajob booth at the SHRM conference this summer, I was lucky enough to receive a copy of All In (How the best managers create a culture of belief and drive big results) (here on Amazon). I knew it would be a great book, and these tried and true authors didn’t let me down. Managers matter: The authors mention a very interesting red/green experiment that still rolls around in my mind when I’m thinking about management/leadership topics to write on. They mapped out their departments using green, yellow, or red. Green teams were higher than average in productivity, profitability, etc. Red were just the opposite and were especially poor in the area of turnover. So the company decided to experiment by moving some “green” managers to “red” areas and vice versa to see the results. Here’s a direct quote, “In every single case, no matter the background or expertise of the manager, within a year the red departments were green and green departments were red. It was the manager who made the difference.” Wow! Yeah, but… Is poison! When you’re looking at a change initiative and trying to get buy in, “yeah, but” is one the worst things you can hear from stakeholders. It’s the sound of a naysayer telling you why the change won’t work, not how it can. (see also: tell me how we can, not why we can’t). If you catch yourself saying that phrase, take a moment to consider if it’s the right thing to say and if you’d be okay with someone telling you that if your positions were reversed. Leaders should regularly ask these two questions: “What do I have to do right now to help my people do their best?” and “What should I not do right now to help my people do their best?” When you’re filtering decisions through those questions you can sometimes make very different calls than you otherwise would without that focal point. Servant leadership at its best: Say what you will about Chick-Fil-A, but they ingrain the concepts of servant leadership into every one of their people. In many businesses you don’t see the manager running around, getting refills for customers, or directing traffic on a busy day. It’s an everyday thing at Chick-Fil-A, and I think that’s one piece that contributes greatly to their success. I’m a fan of Gostick and Elton’s other books as well, and this one was no different. You’ll find ideas on how to develop your team into a powerhouse that gets results and the research to back it up as well. Click here if you are interested in getting a copy of this book. 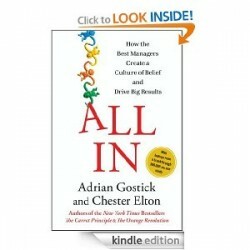 This book focuses how the best managers work to engage their staff by getting buy-in and belief. This grows a strong, healthy culture that sustains great organizations. This entry was posted in General and tagged Book Review, Culture, Employee Engagement on October 31, 2012 by Ben.